This is from a trip into Boston on Thursday evening. A friend was in town to attend a conference, and had a hotel room on the thirty-fifth floor with a magnificent view, so of course I wanted to check it out. The view was amazing, so I took some pictures with my digital camera. This image is from one of the photos I took. The original photograph actually included much more, but I cropped the image to create a closer view and a more cohesive composition. But I managed to keep the things I liked best. There's the Charles, of course, complete with sailboat. You can see the Salt and Pepper Bridge, and if you look closely, you can even see the T (train on the Red Line) as it crosses the bridge. 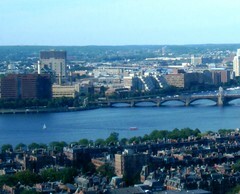 On the near side are the rooftops of the Back Bay, and across the river, you can see Cambridge. I thought this view of Boston might be a nice one to posterize, so I tried it. I will post the result tomorrow. On August 27, I posted a photo showing my progress on this project, a heart-shaped box that I am covering with decoupage and collage. Here is a close-up view taken that same day. 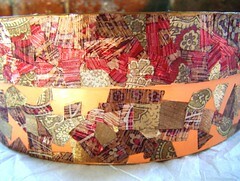 I am using wide metallic ribbon, printed in several patterns. I cut out the pieces I need, based on color and shape. I am trying to fit the pieces together with minimal overlap, to get as smooth a result as possible. This is a painting that I did for my cousin some years ago. It is now hanging in her house in Denver, and when I was there recently, I photographed it with my digital camera. (The light was a bit too dim, and there is a little bit of reflection in the image, but basically this photo shows what the painting looks like.) 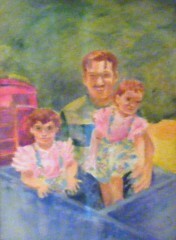 I painted this in the 1990's, not too long after my dad died. It is an interpretation of the black and white photograph posted yesterday, taken by my uncle Ike, and I consider this a collaborative piece. He was a terrific photographer! The painting is done on paper with acrylics used as water media paint. (I did a series of such paintings based on 1940's and 1950's family photos.) I wasn't going for photo-realism here, but wanted to capture the feeling of the image, the happiness of the memory. The colors are evented and I didn't go with realistic colors; I chose the sweet, bright, candy-colors of nostalgia. My father was born on August 28, 1918, and would have been 90 today! 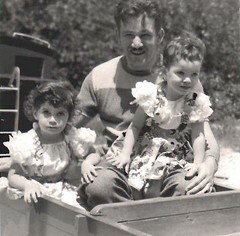 This is one of my favorite photos of him, taking my cousin and me for a ride on the toy train. (My cousin is the little girl sitting on his lap.) This photo was taken in Pueblo, Colorado, but I am not sure whether this was at City Park or at the State Fair. The picture was probably taken by my uncle Ike, professional photographer and family historian. After my dad died, I did a painting based on this photo, and gave it to my cousin. On my trip to Colorado earlier this month, I took a digital photo of the painting (which is hanging in her house) and plan to post it tomorrow. I had planned to post this photo first, but it needed to be rescued. There were a few marks and small scratches on it, exactly in the wrong place, one on my father's face, and another on the hair. So I opened the image in Painter IX and used digital pastel to restore the photo. It was like doing a bit of portraiture because I had to draw in the parts of the features covered up by the scratch. Anyway, here is the rescued photograph. Tomorrow I will post the painting. This morning I finally had a chance to work on this project again. 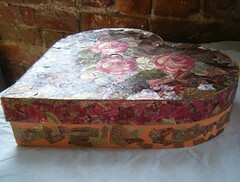 This is a heart-shaped box that once held a Mother's Day present from my daughter. 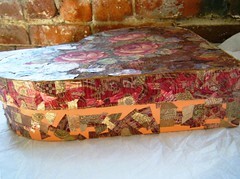 Now I am covering it with decoupage and collage made from printed metallic ribbons. I have been working on the outside of the box, which is going to be predominantly gold. The process resembles doing jigsaw a puzzle, but in this case, I am making the puzzle and solving it simultaneously, so there is no image on the top of the puzzle box to provide clues. I usually work for about an hour, and can go a little longer when I have time. I am making decisions about where to put each little piece, and I want to make good decisions. (In art as in life, small decisions make a big difference when you look at the overall result.) So I try to quit before I get tired, rushed, or frustrated, because that is when I make mistakes. This is how the box looked when I was finished working on it today. This image began as a photo that I took last night with my digital camera, during an evening walk here in Beverly. Tonight I cropped the image and posterized it using PainterIX. 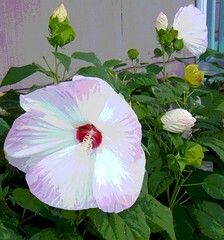 This is another of the many hardy hibiscus plants flowering all over town. (I always thought of hibiscus as tropical, which Massachusetts is definitely not!) I remember having seen a few of these around town in the past, but never in such numbers, and never such big blossoms, so big that you think you are dreaming. Is this because Massachusetts has rarely seen such a rainy summer? I don't know, but these magical flowers seem just right for a season of such big dreams. Just a few days away from September, and huge bright flowers are blooming all over the place here north of Boston, as if to compensate for the short growing season and long winters. 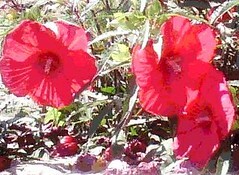 The blossoms are about six inches across and look like hibiscus plants, which I have always thought of as tropical. But I discovered that these are called hardy hibiscus (also called rose mallow). They are just amazing and look like flowers out of a dream. On a very recent walk, I saw some red hardy hibiscus growing above a stone wall on a hill, putting the blossoms at eye level. I took some pictures with my phonecam. Tonight I cropped this image out of one of the photos, and posterized it using PainterIX. Last week, I taught a printmaking class to teens at Red Brick Studios. The cleanup after using the printing press is pretty intense, so to make it more interesting, I suggested we clean the brayers by rolling them over white paper. 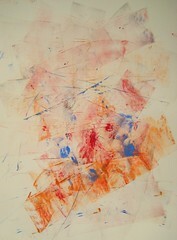 The marks left by the brayer create an abstract image. I did a demo for the students which I posted here yesterday. I think the students enjoyed this way of cleaning up. After the class was over and the students were gone, I still had some brayers that weren't quite clean enough, so I decided to use all the brayers to make another print. I call this "After School" because of the primary colors, and because I was having so much fun, staying after class to make this image. 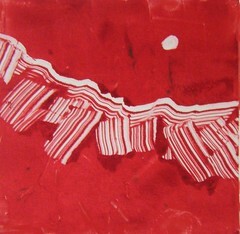 Here is another image that I made this week while teaching printmaking to teens at Red Brick. On Wednesday, we used the printing press, and cleaning up afterward is not easy! The plates are hard to clean, and the brayers are even worse, but printmakers need to learn how to do this, not just to be "good citizens", but because plates and brayers have to be cleaned off when you change colors while printing. To make cleaning up more fun for the students (and for myself), I suggested we make prints (or are they paintings?) by rolling the brayers over pieces of printing paper, using up leftover ink and cleaning off the rollers at the same time. (We used oil paint as ink.) This was my demonstration. This image is very abstract, but I was showing how to suggest a shape by the movements of the brayer. In this case, I was trying to suggest floral shapes, maybe roses. Well, I liked the result more than I expected to, so here it is. This week I taught a couple of sessions of printmaking for teens at Red Brick. First, we worked on ways to print without a press. 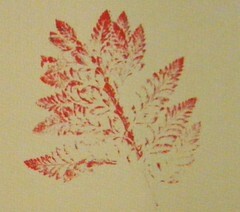 Yesterday's image was my demo of how to make a print with a leaf, paper, ink, and a brayer. Today I am posting the little "bonus" print made in the process, a second imprint of the leaf that remains on the piece of paper that holds the leaf while it is being inked with a brayer. 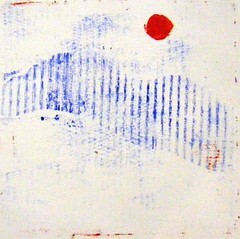 Here is another quick demo that I did while teaching printmaking to teens this week at Red Brick. I did this little print on Tuesday, while showing the students ways to print "by hand". (On Wednesday, we used the printing press.) I brought along some leaves for this project. 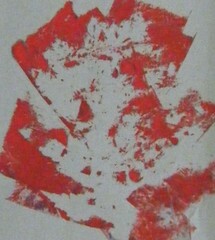 I put a leaf down on white paper, and applied red ink to it with a small brayer. Then I folded a big piece of yellow paper in half, put the inked leaf inside, and rolled a clean brayer over the outside of the folded paper, applying pressure to get a print. This is the result, photographed and cropped to get a good composition. Sometimes during this process, you can get a second print, created on the paper used as backing for inking the leaf. I did get a second print, and I will post that tomorrow. . . . 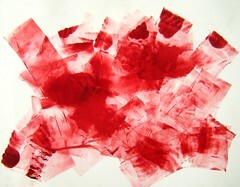 I have been teaching a printmaking class for teenagers at Red Brick Studios. This is part of a week-long art camp, and today was the second of two sessions. Yesterday we worked on printing without a press, using cardboard plates. Today we made simple monotypes on the printing press. Here is the quick little demo I did to show the students, using simple colors and shapes. As you can see, my subject matter was mountains, no doubt because of my recent trip to Colorado. Today I taught the first of two sessions of a print-making class for teens at Red Brick. This is the print I made to demonstrate the assignment, which was to make a plate out of cardboard, adding materials to create shapes and texture. I used corrogated cardboard for the mountains. We inked the plates, and transferred the images to the paper by hand (instead of with a printing press) by applying pressure with a clean brayer. I often use the mountains for imagery because I grew up in Colorado. Today, the Rocky Mountains were very much on my mind because I just left Denver to return to Massachusetts yesterday. For this image, I used a red, white, and blue color scheme because Denver is getting ready to host the Democratic National Convention next week. I have spent the past few days in Colorado, visiting family and friends, and spent last night flying home on a red-eye. Since arriving home early this morning, I have been trying to handle one minor disaster after another, all with far too little sleep. At this point, it is all I can do to just get through the basics. But I did want to make time for this image today. This began with a photo of a pink and white rose, taken with my old soft-focus phonecam and originally posted it here in 2006. Tonight I opened the original version in Painter IX and posterized it. I also used digital pastel to clean up some scraggly foliage in the background, and cropped the image to get the composition I wanted. 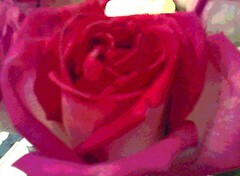 So there you have it: another birthday rose! Here is the second version of this image. 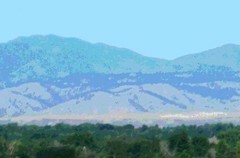 This is a posterized version of a photo from one of my old albums, a view of the mountains between Denver and Pueblo. I saw this view during my recent trip to Colorado, but couldn't take a picture because I was driving (and storm clouds were covering the mountains anyway). So I took the 1988 photo and scanned it into the computer. I used PainterIX to add color overlays and posterize the image, and came up with two versions. The first version has more realistic color. This version, the second, has more impressionistic color, suggesting dreams or memories, so I think it is the best choice for the last day of the trip. During my too short visit to Colorado, I drove down to Colorado Springs to visit close friends. I have always loved the drive between Denver and Colorado Springs because that is where I usually get my first close look at the mountains, and it often makes me cry. 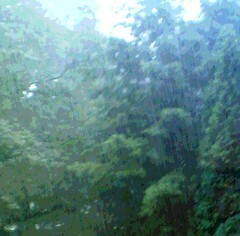 This time, I couldn't take pictures because I was at the wheel, and besides, it was pouring rain. But tonight in one of my albums I found a picture of that view from a trip I made in 1988. (Apparently I was already in the habit of taking pictures from the passenger seat of moving cars!) So I scanned the photo into the computer, then cropped to eliminate the car interior, and cropped again to get the composition I wanted. Then I opened the image in Painter IX and used color overlays (to restore some of the color lost in scanning and enlarging) and posterized the image. I created two different versions, the first with more realistic color, and the second more impressionistic. This is the first version. I drove up to Boulder on Friday morning to have breakfast with a former teacher, one of my all time favorite people, and it was wonderful to see her! It was raining hard and the mountains were completely covered with clouds. But it doesn't matter because those mountains are always in my mind's eye. I have no photos, so here is a painting that I did when I was an undergraduate at the University of Colorado. This is a watermedia landscape done with acrylic paint. I have always thought of this image as Boulder in a thunderstorm, even though the mountains don't look that much like the Flatirons. (Maybe my memories of the Green Mountain Grainery influenced the title!) I see this painting every day because it is hanging in my house, and when I look at it, I always think of Boulder. 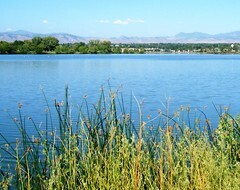 Here is another image from my recent trip to Colorado, a view of the Front Range from Sloan's Lake in Denver. I spent most of my time in and around Denver, with short trips to up to Boulder and down to Colorado Springs. So I really did spend a lot of time driving up and down the Front Range. It rained hard for three of the five days I was there, so I didn't get too many scenic photos. But I made the trip to visit friends and family, not really to see the scenery. It was a short trip, but I made the most of it, despite the rain, and now I am making the most of the images I have. I cropped this one of the background of one of my photos, then posterized it in Painter IX to capitalize on this little view of the Colorado Rockies. 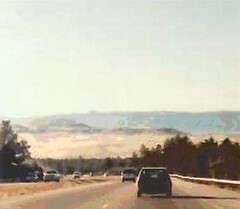 Whenever I go to Colorado, I know I am home once I get a good look at the mountains. I took this photo during my visit last week (on Thursday morning). This is a view of the mountains from Sloan's Lake. It was a beautiful day, typical Colorado weather. Later, I was very glad I had taken this photo, because three very rainy days followed. Colorado seemed to have been overtaken by Massachusetts weather. Much of the time, the clouds were so thick that you couldn't see the mountains. . . , so this is one of the few photos I took of the Rockies. Here are the hosta leaves again. This is the same photo that I posted yesterday, but this time I posterized the photo in Painter IX. Have I mentioned that it has been raining all week? Today, at least, it only rained off and on. 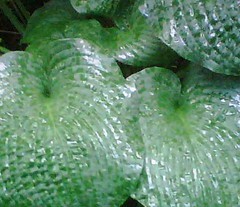 Tonight, while taking some trash out to the driveway, I noticed these hosta leaves. I see them every day, but tonight I really noticed the beautiful patterns of these huge leaves. So I took a quick picture with my phonecam (Blackberry). Then I loaded the image into my computer and cropped it to get this composition. One benefit of rain is that it changes textures and reflections, and makes you really look at things. Summer in Massachusetts can be quite wet, and we have been having several daily downpours this week. But we have been through other rainy summers. Tonight I came across a photo of a rainstorm in my back yard, posted here in mid-July of 2006, titled "Raining Cats and Dogs". I like the original photograph because it captures the light and atmosphere of a rainy day. But looking at the photo tonight, I had the idea of trying to posterize it to see if I could get the rain to show up a little better. First I increased the contrast, then opened the image in Painter IX and adjusted the controls for posterizing until I got this result. You can't see any cats or dogs, but now you can, in fact, see the rain! Here is yet another of the "lost" images that I recently came across while cleaning house. Among the long-forgotten art work that I found in a big bag was a stack of full-size color photocopies of some of my pastel drawings, many of which I have either sold or given away as gifts. 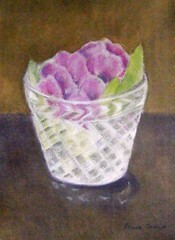 This is one of them, a drawing of pink blossoms in a vase made of cut glass. I did this pastel one night at a session of the drawing group that I used to belong to here in Beverly, about five years ago. Although the subject matter may look simple, I think it is always a challenge to draw from observation, and it is important because it makes you really, really look! 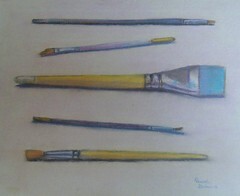 It is also a great exercise to try to capture the shapes and textures of familiar objects, as in these pastel drawings. This is another of the lost images I recently found. (While I was cleaning out a room, I looked in a bag and found some of my art work: small drawings, watercolors, etc.) This image was in a stack of full-size color copies of pastels. I am in the process of making digital images of everything I found, and loading those images into the computer. So this is a photograph of a color copy! But still, I am glad to have the image. I made this pastel drawing several years ago, when I belonged to a drawing group here in Beverly; we met regularly and drew together. Some of the artists drew from photographs or worked on long-term projects. 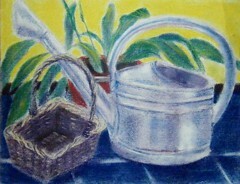 I liked to set up a still life and draw from observation for a couple of hours. Some of the drawings are better than others, but it was always an excellent exercise. Sometimes I brought fruit for the still life, but sometimes I just created a still life setup from what was on hand. I showed this drawing in one of our group shows. This drawing now belongs to friends who have moved away, so I was glad to come across the image again last week. This morning I took advantage of the cool weather and went to the studio to work on this project for an hour. This is a collage and decoupage project in progress. I am decorating a heart-shaped box (received on Mother's Day several years ago), covering it with patterns cut from printed metallic ribbons. Today I worked on the bottom part of the box, which is going to be predominantly gold. It is a slow process, kind of like doing a jigsaw puzzle, because I am looking for the right pieces (hoping not to run out of gold!) and then trying to find the right place for each piece I find. But it is very enjoyable and calming work, almost like a meditation. Here is how the box looked when I was ready to go back home. Last week while cleaning house, I stumbled across some full-size color copies of some of my pastel drawings, along with some other art work (originals and photocopies). Since then, I have been photographing these images with my digital camera so I can have digital versions of them in the computer. 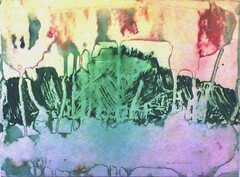 This is one of the pastels I found, or to be more precise, a color photocopy of it, since I no longer own the original. I drew this pastel several years ago, when I was part of a drawing group that met regularly here in Beverly and also held group shows. 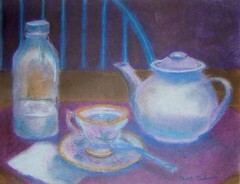 Later, this pastel was shown in a gallery in Rocky Neck, Massachusetts. Until last week, I hadn't seen the drawing in quite a while. I was very pleased to rediscover the color copy of this pastel. Here's one more image from this week's drive up to Durham, New Hampshire. This also began as a photograph taken from the passenger seat of a moving car. I was just trying to photograph the wooded areas on the side of the road. Once I got back home and transferred the images from my digital camera to my computer, I came across this shot. The photo was blurred from the motion, so much that some of the trees looked transparent, and there were some reflections from the window. Although I could have chosen to regard the photo as a "mistake" to be discarded, I liked the composition and even the sense of motion. So I cropped the image just a bit and then posterized it in Painter IX. I liked the result, so here it is. 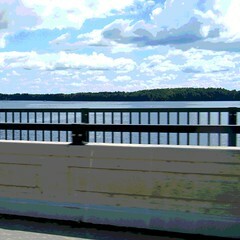 Yesterday I posted a photo of a New Hampshire lake, seen from a bridge. 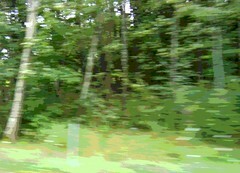 I took the photo from the passenger seat of a moving car, on the way to Durham, New Hampshire. I cropped the image to capitalize on the tantalizing glimpses of the lake seen through the structure of the bridge. I also tried posterizing the image in Painter IX, and here it is. This is a photo that I took today from the passenger seat of a moving car. The occasion was a trip up to New Hampshire to have lunch with a friend from UNH (University of New Hampshire). I love the drive to Durham, which involves going over a series of bridges. The water is an amazing blue. But because of the bridges, it is hard to get a good picture of the lake. Well, I certainly had all those problems during today's trip! I usually deal with the problems by editing the pictures on the computer. Often I try cropping out the bridge to get a closer view of the lake, but the resulting images always seem a little disappointing. However, while I was editing the photos tonight, I tried a different approach. Instead of cropping out the bridge, I tried to find a pleasing composition that used the bridge, working hard to get a square format. What I was trying to capture was the excitement (and frustration) of that fleeting glimpse of brilliant blue. Even despite currently skyrocketing gas prices, a lot of people spend a considerable amount of time looking at scenery this way, through the windows of a moving car. 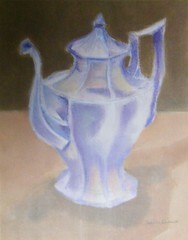 I did this pastel drawing of a silver teapot several years ago when I belonged to a drawing group here in Beverly. We got together regularly to draw and had group shows. One evening, I drew this silver teapot that belongs to one of my friends. I thought the teapot has an interesting shape, and I wanted to try to capture the colors of the reflections in the metallic surface. This teapot was made in Taunton, Massachusetts, where my friend grew up, and so she wanted to have this drawing. My friend moved away several years ago, but turned up in Beverly for a visit, and I had dinner with her last night. She told me that she still has this drawing. As a coincidence, last week I came across some full-size color copies of my pastels, and this one was among them, so I photographed it and here it is. I drew these artists' brushes with pastel some five or six years ago. At that time, I was a member of a drawing group here in Beverly. We got together regularly to draw, and we had group art shows. This drawing was framed and hung in one of our shows, and this image was also used on the postcard advertising the event. The original drawing is no longer in my possession, but this week when I was cleaning up, I came across a full-size color copy of it. As a happy coincidence, tonight I had dinner with a member of the drawing group who moved away four years ago and was back in the area for a visit, so I decided to post this tonight in her honor. It was great to see her again! This image began as a photo that I took earlier this week during an evening walk down to Dane Street Beach here in Beverly. The sky looked like it was a painting, so I took a picture , using the phonecam in my Blackberry Pearl. Tonight when I transferred the image into my computer, I realized there were several people sitting on the park bench on the right. I also noticed looked some patchy lawn and dirt in the foreground. So I opened the image in Painter IX and used some digital pastel to gently move the people on the bench out of the way. Then I cropped the image to eliminate the problem in the foreground. 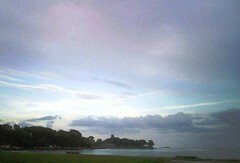 Now the image concentrates attention on the beautiful evening sky over the Dane Street Beach.